Pennsylvania’s regulation of the shale gas boom has been underfunded, inconsistent and ineffective, according to an investigation by the state’s auditor general released today. The audit, covering a period of 2009 through 2012, was launched by DePasquale immediately after he was sworn in as auditor general in January 2013. It came in the wake of a controversy over whether state investigators obscure or alter the outcome of investigations into drilling’s impact on water supplies by disclosing an incomplete suite of chemical tests. The intention of the probe, according to a letter from DePasquale at the time, is to determine the "adequacy and effectiveness of DEP's monitoring of water quality as potentially impacted by shale gas development activities, including but not limited to systems and procedures for testing, screening, reporting and response to adverse impact such as contamination." The report was blunt in its findings: the problems related to shale gas development are much deeper and broader than the DEP can presently handle, and they often go unaddressed or left up to industry without adequate follow-up by the agency. The problem is rooted to a wholesale lack of inspections, enforcement and transparency. Often, according to the report, the agency does nothing about confirmed cases of water pollution tied to drilling problems. After reviewing a selection of 15 files of water degradation tied to nearby shale gas operations, auditors found the agency issued only one order for the driller to restore or replace the water supply. Instead, the DEP relied on voluntary action by companies to resolve complaints and violations. • With respect to transparency, auditors discovered that accessing DEP data is “a myriad of confusing web links and jargon” that was often incomplete. “We could not determine whether all complaints received by DEP actually were entered into the system. What’s more … it is difficult to figure out exactly how many complaints were received, investigated, and resolved by DEP,” DePasquale said. Although reports critical of the gas industry and regulators are nothing new, the inspector general’s report is noteworthy because it comes from within an independent arm of state government. The DEP disagreed with all of eight findings of the audit critical of the agency, but agreed with a majority of the 29 recommendations for improvement. ·• Reconfigure the agency website and provide complete and pertinent information in a clear and easily understandable manner. None of this comes as a surprise to those who have been closely following what is going on in PA, but I am very happy to see the issue being addressed by PA's Auditor General Eugene DePasquale and I hope that residents in PA, NY, and everywhere else will pay attention to DePasquale's findings. Given that the PA DEP is understaffed and underfunded, one wonders if there are many additional cases of water contamination that should have been included in the PA DEP's database, but ended up being overlooked or swept under the rug. Even if that is not the case, and 209 is the accurate number, it is certainly a large enough number to cause grave concern. Has anyone been watching the PBS Mystery series "Endeavour?" It's a series centered around the "Inspector Morse" main character - as a young man. Yes/no? Anyway, we are finding out that young Morse is in the middle of a highly corrupt circle of shadowy people including businessmen, politicians and police. All within Oxford, England. Man, that town has a lot of murders, if you include the original Morse series, Inspector Lewis and now Endeavour. For some reason, I thought of Pennsylvania and its dealings last episode. This post confirms my musings even more. I found that Bradford and Susquehanna Counties combined had only about 11% of the wells drilled during that period in the state. So that's about 11% of the wells, and about 40% of the cases of confirmed water supply damage. There may be many reasons for these disproportionate numbers--maybe it's a reporting/enforcement artifact, maybe there are more people in these areas dependent on private water wells, maybe it's a geological difference. But whatever it is, I think it's clear that further investigation is needed. Mary, Thanks for doing the math and pointing this out. Yes, Bradford/ Susquehanna Counties are confirmed hotspots for water problems. Many factors may be at play, but geology is certainly one of them, according to geologists I have interviewed. 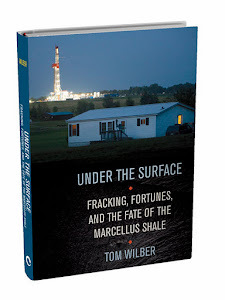 Upstate NY has a history of its own methane problems with conventional wells, which I recount in my book, although documentation is scarce due to lack of reporting requirements. Thanks, Tom. Do you know in what way(s), specifically, the geology comes into play? Not specifically. But it has been explained to me that certain areas along the NY/Pa. border tend to have faults that serve both as water conduits but also make methane migration more problematic. The methane problem is compounded by drilling. Any insight on the Colorado fracking compromise? It may impact PA and potentially NY. Who were the environmental groups inside the smoke filled room? Probably not smoke filled, but closed door. Tambo -there are other forms of energy that are freely available to us, cheap to acquire and do not cause these problems that fracking causes and also help to protect us from the disaster that is climate change.